#AditiRaoHydari wins 'Acting award' for #YFLO Young Women Achievers Award 2017-18! 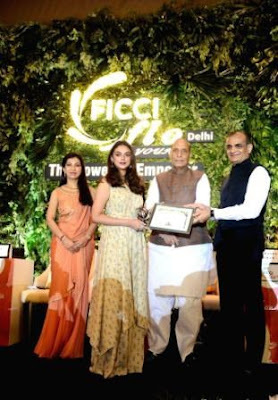 Owing to an impressive body of work, her contribution to cinema and huge successes at the Box Office this year, Aditi Rao Hydari has been awarded the acting at the YFLO Young Women Achievers Award 2017-18, in New Delhi, in the presence of Hon’ble Home Minister, Shri Rajnath Singh. The talented actress bedazzled viewers with her angelic beauty and mesmerizing act as Mehrunisa in Sanjay Leela Bhansali’s visual extravaganza, Padmaavat, which continues to rewrite history with its booming collection. Sharing screen time with Ranveer Singh, Deepika Padukone and Shahid Kapoor, Aditi earned praises from film critics across the country for holding her own throughout the film. Earlier in 2017, Aditi also won viewers’ hearts down south with her stunning performance in Mani Ratnam’s Kaatru Veliyidai, which fetched her an Asiavision Award for the category, Best Actress (Tamil). With a pan-India presence, Aditi has collaborated with some of the biggest directors of Indian cinema including Sanjay Leela Bhansali, Mani Ratnam, Imitiaz Ali, Sudhir Mishra, Rakeysh Omprakash Mehra, Abhishek Kapoor and Bejoy Nambiar. The versatile actress has received accolades from the best in the film industry that testifies to the brilliance of her craft. Talking about the award, Aditi said, "I'm honoured to receive this recognition before such esteemed dignitaries. I've always tried to follow my heart and today I'm glad where it has led me. I thank my fans and viewers for spoiling me with love. I thank all my directors for believing that I could do justice to their vision."